OCEAN BEACH, CA. To those who believe that the beautiful Sunset Cliffs – a wonderland stretch along the Pacific just south of OB – are a static monument of nature, should gaze carefully at these photos sent to OB Rag by Larry O’Brien, expert and lover of the cliffs. 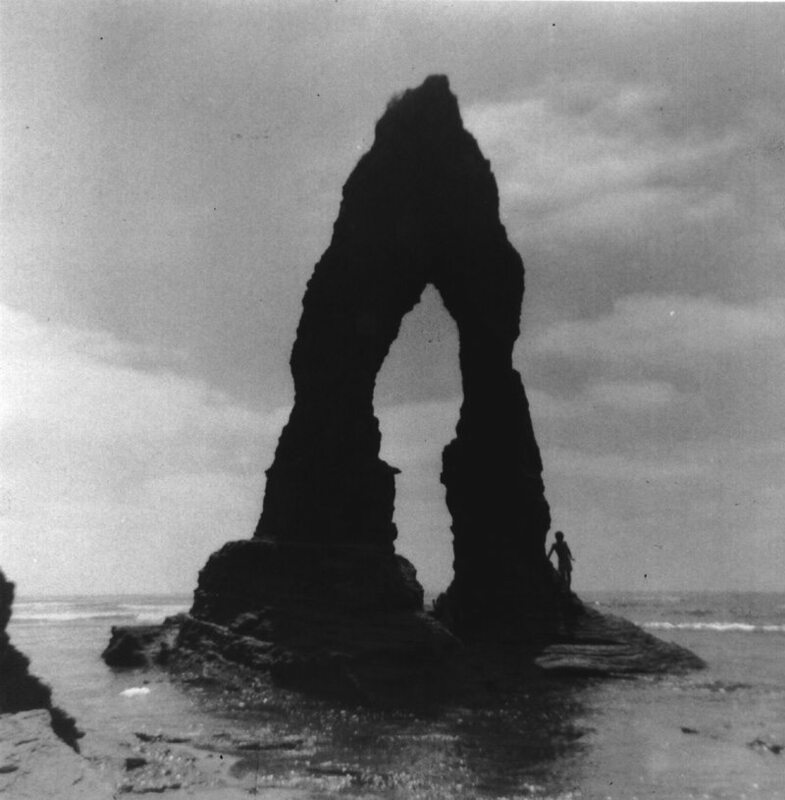 The old postcards are of “Needles Eye”, a wonderful work of rock, wind and water, and it stood on its lonely pedestal until an earthquake destroyed it, I believe, in the early, mid-1960’s. Growing up along Sunset Cliffs, I remember Needles Eye, or just simply “Needles”, and it was probably the most amazing piece of nature along this stretch of cliffs. I post this to counter all those who think dumping boulders over the sides of the cliffs and doing other things to halt the erosion is the best way to proceed with the cliffs. The Cliffs change, they erode; they’re mainly made of sandstone. They have been doing this erosion thing for a long time. No longer can we allow the City to destroy the cliffs in order to save them. The city could care less about the cliffs. They aren’t dumping rocks, or making walls, or anything else to save the cliffs, they are attempting to save valuable property along the cliffs, so the wealthy may continue to have an ocean view. How many rocks or walls have been dumped or built on the undeveloped south sections of the cliffs? The answer my friends is none. Jettyboy is right, altho’ I would also add that the boulders are not only meant to protect the views for the rich, but also to protect the homes of the rich, the homes that are vulnerable from slides and erosion along the cliffs. Wow, thanks for posting these Frank, and thanks to Larry for sending them in. After spending last Friday morning in the caves and tidepools I have a whole new appreciation for these cliffs. Up ’til now I only had Frank’s description of Needles Eye. How far is the city willing to go to protect the clifftop homes? Will we put the ecosystem to a screeching halt, prevent the neccessary change of nature, to make sure we can keep building wherever we want? However, it is a misconception that all the people who live along the cliffs are “rich”–Although they live in multimillion-dollar houses now, many bought them years and years and years ago, and are now just really lucky, not rich. How to deal with it when CA is highly populated and in the worst drought in 88 years? Larry (Lawrence) Adjudicator Master of Pulleys, Lord of Levers And Nobes Wisdom ‘CaveMan’ O’Brien of the King’s Council of the Fellowship of the Lady’s And Men of the People in the Realm of the Kingdom of the Lady Nobes is a brilliant man and a man that has the intelligence and wisdom to help fix this coastline problem that is facing the whole planet, there is a way and we shall see. and the king, who returns yearly to survey his kingdom, has spoken. I apologize for being ignorant…………. and disrespectful to all of you………. It seems the philosophy here is we’re supposed to forgo protecting the coastline from further erosion (and loss of property, public and private) because of the wondrous, picturesque beauty of random shapes in dramatic rock formations created over long periods of time. Is that a good take on this? It ignores doing so, over time, will eventually make the ground under the feet of the photographer cease to exist. It will create a public nuisance and huge liability as the cliffs progressively crumble and people explore out to the edge and fall off ground that was solid the last time anyone checked. There is no denying the jaw dropping beauty of that photo. Don’t think man is destroying the beauty of nature by putting up boulders, nature gives us beauty by putting the needles there, nature taketh it away with erosion from waves and an earthquake. Its beauty was random and fleeting, like that of a snowflake. We don’t lament its melting because we know it will appear again some day in another way- and don’t foolishly hope for a blizzard. I love your comparison to a fleeting moment and a snowflake! It must be worth mentioning however. That San Diego or civilization itself for that matter is clearly the snowflake of time in comparison to a coastlines existence. Thank you for the lovely example! Good to see “NEEDLES” I was young went it went….think it was 1963 ish ,,,Thank you Larry….Knew you guys back then through the early ’80’s, Larry, Jeff “Slow” and I even have your little brothers (Mark??) red “LIS” that he glassed and still ride it. I like the photo in The Surf Guide of Southern California and early surfer magazine before it was trash. The Needles were quite resplendent following the top collapse which left 2 pinnacles. My favorite phase. 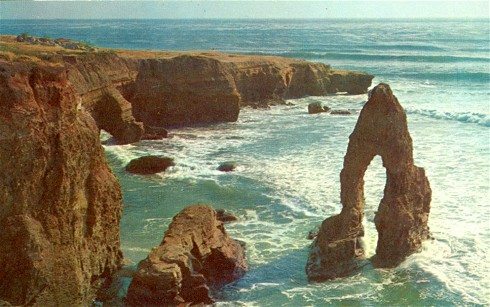 BTW Classic geologic research from Scripps Institute ( book) Kuhn, Shepard: Sea Cliffs, Beaches, and Coastal Valleys of San Diego County: Some Amazing Histories and Some Horrifying Implications. the above referenced book is great found here. Building sea walls and dropping rocks are man made crutches. They increase high tide backwash scouring effects removing sand from the pocket beaches. Adding these temporary crutches decreases the natural erosion processes that add sand to the system. Talk to people about what pescadero beach used to look like before rip rap and sea walls capped the cliffs from Santa Cruz to Orchard. Sea walls and rocks temporarily protect roads and private property but destroy the natural beauty of sandstone cliffs. Ultimately Sunset Cliffs Blvd will have to function like pleasure point in Santa Cruz it will be forced into a one way street by nature. Where was the Eye of the Needle? Is there anything left of where it was? I enjoy going out to the cliffs and looking at where the old formations were like Spaulding’s pool etc? The Eye – or some simply called it “Needles” – was just north of the jutting out ledge and surf spot called “Luscums” – see photo – (ol’ surfers, please correct me) – where I personally learned to surf, but after the Eye fell. Luscums is just south of “No Surf”. Luscombs estate and their namesake reef is to the south of Needles and “around the corner” . The two nobs at the base of the eroded Needles formation can be discerned if one looks from the cliff edge from the, wedding stage, down at the reef within about 20 feet of the foot of the escarpment, at low tide. An incredible new collapse just occurred so time to watch, for any new “breaks” to the north above Osprey. It’s great no one was hurt by this act of Mother nature. Hard time finding the Needles ? The photo says it all. Older Article: Just Who Is Gretchen Newsom?